Want to increase the variety of looks you can get from your accessories ? Or to simplify your casual-but-special wear this holiday season – just get a silk, shiny, embellished or lace scarf, wear it with your basics and tie it in an interesting way. For something unusual and striking, try Elizabeth Gillett NYC Vogue 8762 (now out of print). Here are some links to guidance on scarf wearing. 50 + ways to tie a scarf, with individual videos. Eileen Fisher scarf tying videos (scroll down to How To section). YouTube video on 25 ways to wear a scarf. Imogen Lamport video on pashmina tying in her post on winter accessories. Maitai’s picture book tutorials on scarves with many photos – see How Tos in her right hand menu. ‘Go Chic or Go Home’ gives links to several other sites with many ways of tying scarves. Nancy Nix-Rice lesson on scarf tying with photos of finished styles and written instructions. 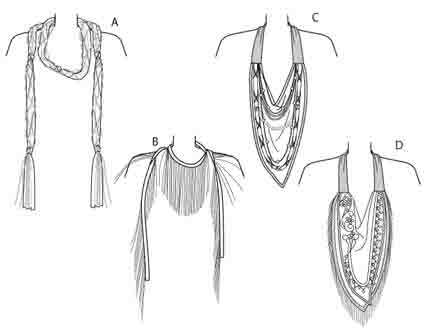 – don’t enlarge your bust here (many examples of large scarves). Other accessories ? – a host of ideas for combining accessories in nearly every post from The Vivienne Files. And here’s a piece from YouLookFab about brightening your outfit using accessories. Me, I’m learning to use accessories this year, and I’ve solved my festive-wear questions with a new lace scarf and some bling – which I don’t usually wear at all ! Here’s YouLookFab on the ‘big’ scarf. This entry was posted on December 1, 2012 at 8:46 am and is filed under personal style. You can subscribe via RSS 2.0 feed to this post's comments. Both comments and pings are currently closed. I love scarves and wear them everyday in the winter. When you sew, they are so easy to make! And as you say, they really can change the look of anything you wear.